The next meeting of the UAE SharePoint User Group will be held October 9th, Wednesday at 7:30 pm. 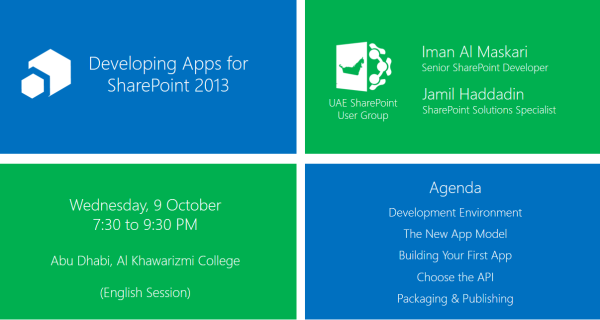 Our talk this month is Developing SharePoint 2013 Apps by Jamil Haddadin & Iman Al Maskari. We are meeting at Al Khawarizmi College, beside Abu Dhabi Mall, The class room 603. Please tell anyone at your company or friend who might be interested!